It’s a big universe out there, but around every star, on every planet, the old saying holds true… we all gotta eat! The most influential, inspired, or infamous chefs in the quadrant cook on Uranium Chef, the most popular cooking/bloodsport show on the neutrowave. Tighten your apron straps and hold on tight, as you’ll have to survive surprise ingredients, full-contact kitchen combat, and the snootiest food critics in five dimensions. Will you wow the judges and woo the audience? Do you have what it takes to be crowned the new Uranium Chef—or will you get the chop? 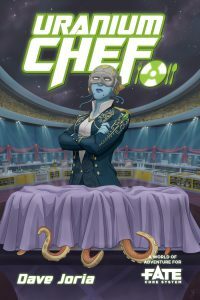 „Hitchhiker’s Guide to the Galaxy“ meets „Top Chef“ in this new Fate World of Adventure by Dave Joria. Here’s another item to add to your GM toolkit: NPC Cards. These come in two different formats, a printable version and form-fillable individual cards. These follow the NPC creation structure in Fate Core, but can be used to make FAE NPCs as well as mobs and groups. And as always, they are free on DTRPG. Der Autor Nathan Hare hat aber noch den Fate PC Tracker und das Fate Scenario Worksheet veröffentlicht. 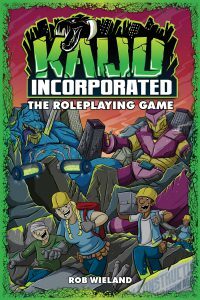 Der Beitrag Uranium Chef, Kaiju Incorporated, NPC Cards erschien zuerst auf FateRpg.de.